Properly setting a banquet table will depend on the menu and the courses being served. More courses will typically mean additional silverware. The silverware will be organized so that the pieces used first will be the farthest from the plate. If soup is being served, the soup bowl will normally be placed on a dinner plate. Cover the table with a cloth tablecloth. Place charger plates on the table, one where each person will sit. A charger plate is larger than a dinner plate, and it is basically a "place holder." If a butler or waiter was serving the dinner, he would typically remove the charger plate and replace it with the dinner plate. If it is a buffet, the dinner plate will sit on top of the charger plate. Charger plates are often gold, silver or glass. Organize the silverware in the order of how it will be used, with the last piece closest to the plate. Place the soup spoon or teaspoon the right side of the charger plate, with the knife between the edge of the plate and the spoon. If fish is being served as an appetizer, place the fish knife between the knife and spoon. All knife blades should be facing the plate. Place the dinner fork next to the left side of the edge of the plate. Place the salad fork next to the dinner fork . If an appetizer is being served, place it between the salad and dinner fork. Set the salad plate above the forks. The bread plate will be to the right of the salad plate, to the upper left of the dinner plate or charger. Lay a butter knife over the bread plate. Set the water glass above the knives. To the left of the water glass, set the wine glass. 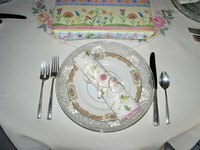 Arrange a cloth napkin at each place setting. The napkin can be folded artfully and placed over the plate, to the left of the forks or under them. Place a dessert spoon and fork above the plate, perpendicular to the other silverware. Place bread baskets, butter dishes and salt and pepper shakers along the center of the table. If coffee or tea is being served, include sugar and creamer bowls and arrange the coffee cup to the right of the spoon, near the glasses.